Standard Heritages principle surveyor – Michael Foley was at West Dean College recently completing module No. 7 of 10 to qualify for their Professional Development Diploma. This latest module was the Building Conservation Masterclass – Conservation and Repair of Structural and Architectural Metal Work. Michael is in his third year of part time study at the college and is expected to complete the final module this coming September, along with the submission of a portfolio on how the modules of the diploma were applied to his professional practice.This leads to one of the most respected professional qualifications in the repair and conservation of historic buildings; the Professional Development Diploma: Historic Building Conservation and Repair. The diploma is recognised by Historic England (formerly English Heritage), the Institute of Historic Building Conservation (IHBC), the Royal Institute of British Architects (RIBA) and the Chartered Institute of Architectural Technologists (CIAT) to name but a few. ‘This course covers the conservation of structural metalwork, architectural features and statuary. It includes both ferrous and non-ferrous metals, with tuition from leading practitioners on a wide range of repair techniques. It also includes the methods of manufacture and shaping of ferrous metals, the history of their use, deterioration, surveys, practical cleaning methods, surface preparation and coatings, and specifying metalwork repairs. It covers corrosion science, the latest developments in cathodic protection as a remedial solution to rusting cramps and the science of traditional electrotype forming as used for statuary. There will be a ‘hands-on’ opportunity in the Forge when students will be able to try out traditional and modern techniques relevant to architectural conservation such as forging at the hearth, arc and gas welding, flame cutting and needle gunning’; ( West Dean College 2018). 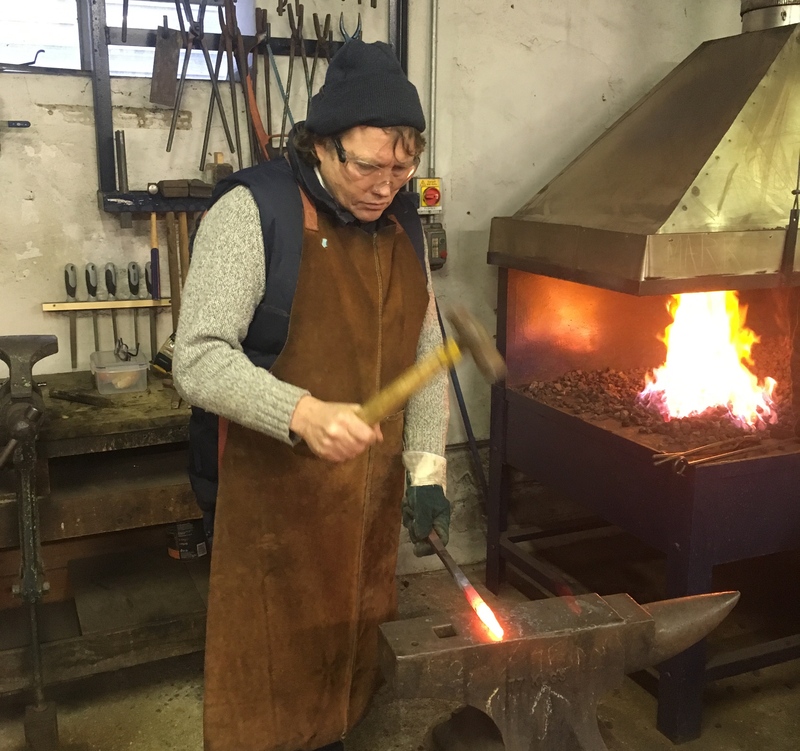 As usual Michael likes any opportunity to get to grips with the tools and materials in front of him – one of the group asked him if he had a background in Blacksmithing ! This was due to his heavy handling of the hammer ! Do you have an issue with any structural or architectural metalwork in your building ? If you do please contact us for advice. Michael at work on the anvil – striking while the iron is hot. Rot about Dry Rot in Margate !! !